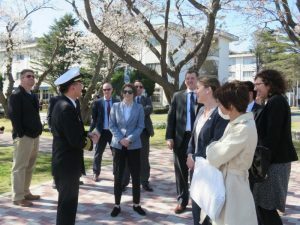 Last week, the 23rd class of Mansfield Fellows visited Fleet Activities Yokosuka for a tour of the naval base. Captain Jeffrey Kim, an Alumni Fellow (MFP 20) and commander of the base, met with MFP 23 to discuss the role of the U.S.-Japan security alliance, and how his experience with the Fellowship Program has helped him in his career. The tour included a visit aboard the USS Ronald Reagan, the only forward-deployed aircraft carrier in the Navy. This entry was posted in Alumni, Fellowship Experiences and tagged Fleet Activities Yokosuka, MFP No. 20, MFP No. 23, U.S. Navy. Bookmark the permalink.